Several animals bear a striking resemblance to the gray wolf (Canis lupus), usually because they are extremely closely related, in some cases so closely that they can interbreed to produce fertile offspring. Genetically and in terms of appearance, the most similar animals are coyotes, a couple of other wolf species and domestic dogs, but several wild canines have a passing resemblance. Dogs have been domesticated for so long that they are now considered a separate subspecies -- Canis lupus familiaris -- but they are descendants of the gray wolf and some breeds show this very clearly in their appearance. Siberian huskies, Alsatians and several other sled and herding dogs in particular have a similar build, coloration and size. If you see a wolf-like animal prowling in a suburban or urban area, he’s probably a loose dog. 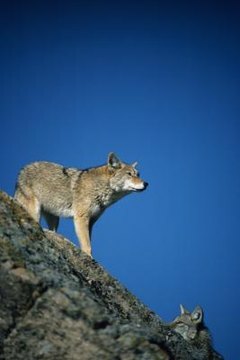 Coyotes (Canis latrans) are also closely related to wolves, although not as closely as domestic dogs, and can interbreed. They tend to be far smaller, though, and somewhat less reclusive. Unlike wolves, coyotes venture into inhabited areas on occasion, joining the array of urban wildlife. After domestic dogs, coyotes are the large canine you’re most likely to see in North America. The gray wolf is not the only wolf, although it is the only one native to the United States. Three other canids commonly called wolves exist: the Ethiopian wolf (Canis simensis), the maned wolf (Chrysocyon brachyurus) and the red wolf (Canis rufus). All these animals are threatened, endangered or critically endangered. Another, the Falkland Islands wolf (Dusicyon australis), is already extinct. The three species of jackal also resemble wolves, although they are considerably smaller. For example, the golden jackal (Canis aureus) reaches a maximum length of about 3 1/2 feet including tail, compared to the 6 feet or more of a gray wolf. All species of jackal are native to the old world, mainly Africa. As well as jackals, coyotes and wolves, the family Canidae contains numerous species of foxes and wild dogs. Foxes have much the same shape as their cousins but are far too small to be mistaken for a wolf unless you have extraordinarily bad eyesight. Wild dogs, a term which includes several not particular closely related species, are larger but tend to look more like typical domestic dogs than wolves.